We’ve all been there: blow drying our hair, vacuuming up, turning on the kitchen blender, only to have the lights go out from an overloaded circuit, and ultimately, a blown fuse. Wires and a variety of devices being plugged in are all a part of our everyday lives, so it’s easy to forget that they can easily overload a home’s circuit breaker, until it’s too late. Luckily, the experts at Farryn Electric have three tips that can help shed some light on this topic, so you can keep your circuit breaker happy, your fuses from blowing and your home running smoothly. In order to figure out how many devices you can plug in without blowing a fuse, you must first figure out how many circuits your panel can handle. To figure this out, open your electrical panel to find the information of how many amps each circuit can handle without being overloaded. From here, multiply the amperage rating by 120 volts—this will give you your total wattage capacity. For example, the maximum wattage of a 15-amp circuit (multiplied by 120 volts) is 1,800 watts. A tripping circuit breaker can be a pain, so if you want to keep this from happening, you may want to think twice the next time you whip out your an extension cord as an easy solution. While extension cords can give your circuit some temporary relief, it’s important to note that they are not a long-term solution. And as with most things in life that come with a user manual, it’s important to read the one that comes with your extension cord and to follow the tips in it provided by the manufacturer. To decrease your chances of blowing a fuse, compare the wattage and amperage rating of each of these devices with the amount of power your circuits can handle. This information should be easy to find on their packaging, rating plates or tags. Once you know these numbers, it will be easy to determine if your circuit is overloaded or not. If you’re finding that you’re constantly cursing (in the dark) because of a blown fuse, there may be an issue with your circuit’s wiring. The only way to figure this out? With the help of the experts at Farryn Electric! Not only do we have the tools and expertise to detect the issue for you, but we’ll easily fix it, so you can blow dry your hair, plug in those new surround-sound speakers and vacuum the day away without having to worry about blowing a fuse. Contact us today! 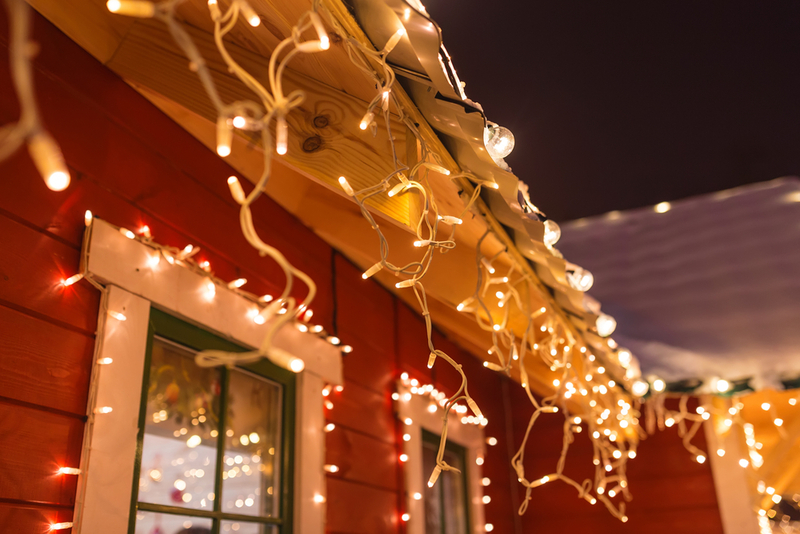 Tips to Make Your Home’s Exterior Holiday Lights Sparkle Safely! Exterior holiday lighting brightens up the holiday season—it creates a heartwarming scene, it conjures up feelings of nostalgia and it makes homes glisten in the winter night—but decorating your home with these festive lights can create electrical safety issues that can harm you, your family and your winter wonderland. To protect your home this winter, the exterior lighting experts at Farryn Electric have come up with four ways to ensure your home can sparkle this holiday season, while also keeping it safe from electrical safety hazards. Adding lights to garland takes your home’s decorations to a whole other magical level, but they require the use of extensions cords—the right ones, that is. Whether you have garland accentuating your front door, wrapped around lamp posts or swirled around structural pillars, be sure to use extension cords that are specified for outdoor use only and that are in good condition with no fraying or other damage. When you’re standing on a walkway lit up by sparkling lights, it’s hard to not feel like you’re walking through a winter wonderland. However, outlining your walkways, exterior steps and driveway with holiday lights requires a lot of wires—the placement of which matters. To prevent tripping, wire-damage and fire hazards, keep wires out of heavy foot traffic areas, away from areas that typically collect water and safely covered with products made to cover them. Too often, people forget that their lawn is prime real estate for holiday light decorations, but all this extra lighting can make your circuits work overtime. To ensure your don’t blow any circuits this holiday season, look at the amp-rating on your lights as well as the amount of lights your circuit can safely handle. To prevent electrical issues, it’s recommended that you should load your circuit up to 80%. If you have a 20-amp circuit, this means that you can safely handle 16-amp lights. Landscape lighting will certainly make your home stand out this holiday season, but just as Christmas trees have been known to cause fires, so can your outdoor shrubbery. Whether you’re adding exterior lights to trees or bushes, avoid tree fires by utilizing LED lights—these are the safest choice in lighting because they emit the least amount of heat. Realizing you have extension cords powering too many of your holiday decorations, need to fix an outlet issue or want help with your exterior lighting? Then enlist the help of a professional (after all, Santa doesn’t do all the work himself either)! At Farryn Electric, we make exterior lighting easy—from accent lighting on your home to lighting on your walkways and pillars, you can have a merry and bright home without having to stress about any electrical issues. Contact us today to set up your exterior lighting appointment! 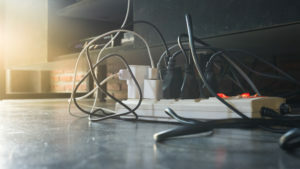 Power surges can wreak havoc on your expensive electronics and appliances. A whole-house surge protector can save you both time and money in the long-run. This will safeguard your entire electrical system. At Farryn Electric we are here to help our customers! People tend to think a power surge is caused by something outside, like when lightning strikes or when a power line goes down. While external influences like lightning aren’t the most common cause of power surges, they can certainly cause the most destruction because it involves the entirety of your home. 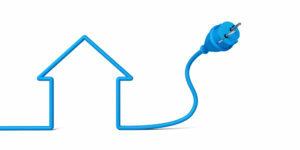 Believe it or not, power surges usually occur right inside the home. One of the most common causes of a power surge is overloaded outlets or circuits. Plugging in too many appliances or electronics in the same socket can lead to power surges and electrical fires. Damage or exposed wiring is also a common cause of power surges. This can cause power surges when electrical wiring is damaged because the electricity that is flowing through the wiring is not being directed as it normally would. Lastly, high power electrical devices like refrigerators and air conditioners can cause energy spikes and power surges. This happens because these appliances tend to draw an abnormally large amount of electricity. 80 percent of surges are generated internally. Most of these surges are very short and come from your homes appliances, but over time these surges can degrade the performance of your appliances. Having a whole-house surge protector can protect your home for years. This device is wired to your electric box and is typically placed in a more convenient location to be easily accessible. Protective devices aren’t required by building codes or homeowner’s insurance carriers. However, it is recommended by the National Fire Protection Association and the Institute for Business and Home Safety. The good news is that protection is readily available, and affordable! Feel free to give us a call at (484) 316-0449.